I’d be lying if I said I had all of my finances figured out when I was a college student. I’m actually laughing just thinking about how lost I felt trying to figure out my financial aid and what to do with the little money I actually had. Looking back, I could have really used a college budget template to help me keep things organized. I know that a lot of college students don’t really have budgeting in the forefront of their mind, but it’s just one of those important things that everyone needs to get a grasp on. Without proper preparation and financial understanding, students could find themselves waist-deep in student loan debt by the time they finish their degree. That’s why I want to offer this free College Budget Template Printable (click to download). I understand that sometimes you just need a little guidance to make sure you budget everything appropriately. 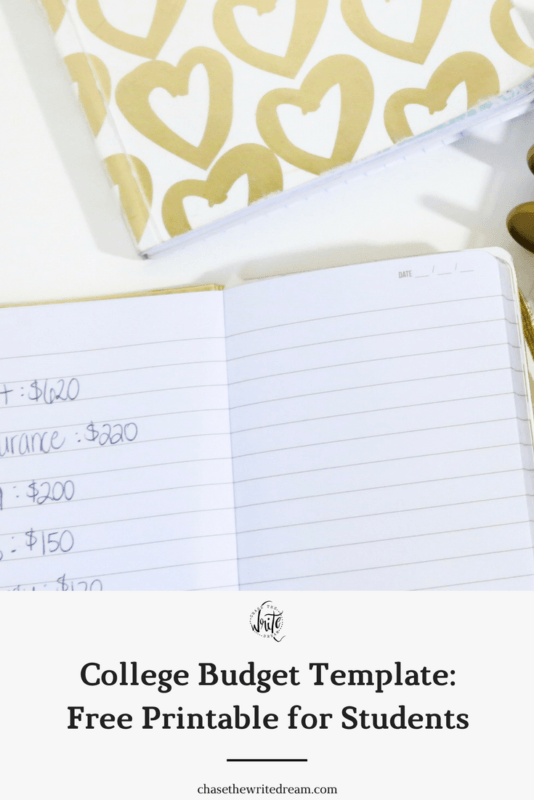 To help keep things clean, I created three separate budgeting sheets for college students: one for the overall budget, one for tracking expenses, and one for keeping track of financial aid. To make the college budget template work for you, you’ll need to know your various income sources, as well as any expenses that you’ll have. The typical college student budget will vary based on various factors, so keep that in mind! For example, you’ll want to figure out how much financial aid you’ll receive each semester, how much your tuition is, what your dining pass is going to cost, and so on. Finally, I included a financial aid sources sheet in this college budget template so that students know just how much aid they’ll receive for a semester. There are columns to enter the award name, the amount, the type of aid (i.e. grant, scholarship, loan), and if it needs to be repaid or not. One of the perks of having a financial aid sources printable is that you’ll always know where your money is coming from and if you need to worry about paying it back in the future. I would recommend printing a new one of these out every semester and then keeping any old copies in a folder of some sort. By doing this, you’ll be able to track how much financial aid you earned over your degree, as well as any student loans that will need to be repaid. Who Doesn’t Love a Free Printable? Although this college budget template is geared toward students, it can still be used for people from all walks of life. Take the expense tracker for example –we could all use a little help when it comes to tracking where I money goes! If you know any students, I hope you’ll share this free budgeting printable with them! Let’s all get financially fit together! Want more financial resources? Check these out! What a great resource this is! I wish I had one of these for my post-grad life! I feel like I struggled so much in college with finances. It is where I learned to make lists and budgets. This would’ve been helpful! I wish I had cared about my finances in college like I do now. I didn’t care if I spent $70 on one item of makeup, now if I am going to buy one face primer for $70 I better budget that in! So true, Ashley! I started thinking about finances in college but not to the extent that I do now! I totally wish I had had this when I started school! This is great! Can even be helpful for the post-grad life when you’re just starting out. I know I’ve had to make something like this for myself lately. Hi! This is great! I want to download the printable but I cannot find it. Nevermind, I found it! I thought it was an ad. Haha. I’m glad that you found it, Haley!